Firefighters from Portsmouth and several neighboring communities were working since roughly Friday to supply Southern Ohio Medical Center with water as the city’s water shortage continued. That effort was to come to an end early Thursday. The county EMA reported the mission to support SOMC was handed off to the State of Ohio Fire Response Plan, pulling in fire tanker and pumper reserves from across Ohio. “This is not just going to go away. There’s no sense in candy coating it,” Acting Mayor Kevin E. Johnson said earlier this week regarding ongoing water problems around Portsmouth. Subsequent events appear to have proven him very much correct. After reporting that everything was getting back to normal Wednesday afternoon, on Thursday morning the city health department issued a release stating that overnight there had been yet another waterline break, this time in the area of Eighth and Harmon streets. That water break was said to have affected approximately 80 homes and some 240 people. At 8:30 a.m., the city reported crews had “isolated” that break but another “minor” break had happened in the same area. Residents were encouraged to boil to be ingested. While showering, it was suggested residents avoid swallowing water. A press release from the city health department on Wednesday supplied a sort of history or narrative regarding the recent water crisis. The city said areas affected by the then current water problems normally receive water through two pipe systems fed from the water treatment facility located next to the New Boston Walmart. The plant pumps water through a low-pressure system which supplies the lower elevations and a high-pressure system that supplies the higher elevations to include the Sunrise Reservoir and Sunrise holding tank. To facilitate upgrades to the high-pressure system which feeds the hilltop area and the holding tank, water was switched to a smaller line. The switch was blamed for breaks in both the high and low-pressure lines. On Wednesday, Acting City Manager and Portsmouth Water Works Director Sam Sutherland said one of the booster pumps at Sunrise was pumping water to the high-pressure system – but at reduced pressure, according to the health department. Sutherland added the city had received a backup pump, apparently courtesy of Ohio Department of Natural Resources. On Thursday, city and county officials reported a second pump – not the ODNR pump – was now in place at Sunrise and helping provide steady water pressure in the hilltop area. In the same statement, released at 11 a.m., the Scioto County Emergency Management Agency said the Ohio Environmental Protection Agency (OEPA) representative on scene and working directly with Sutherland reported all water customers were now back in service and that efforts were continuing to fill the water tank on Sunrise Hill. The tank was at around 17 feet of a total of 75 feet in capacity at that point in time. Once the smaller tank is filled then the high capacity pump secured from ODNR was to begin filling the 22 million-gallon reservoir on top of Sunrise Avenue to top off water reserves serving the entire city. In addition to dealing with a cascading series of water breaks, officials have also been hustling to provide water to the Southern Ohio Medical Center. Johnson readily credited firefighters from Portsmouth and surrounding communities who he said were working as “unsung heroes” bringing water to the hospital in pumper trucks since the beginning of the crisis. “We want to take a moment to show our appreciation to all of the local fire departments that are working tirelessly to support SOMC and our patients at this time. By operating on their water system, we are able to continue providing quality patient care even as we are impacted by the city’s water pressure issues,” SOMC posted on its Facebook page. Local fire department efforts apparently came to an end yesterday morning. The county EMA reported the mission to support SOMC was handed off to the State of Ohio Fire Response Plan, pulling in fire tanker and pumper reserves from across the state to sustain hospital operations through the weekend or until SOMC’s buildings again can be serviced fully by the city water system. At 1 p.m. Thursday, possibly with a sigh of relief, city officials reported the boil advisory for the hilltop area had been lifted. The health department did note a Harmon Street boil advisory remained. Hilltop residents were still being encouraged to conserve water to assist in filling the system’s reserves. Some ways residents can conserve water include drinking bottled water, refraining from filling pools, watering lawns, or washing dishes and laundering until the situation has been remedied. If you are affected by the Harmon Street boil advisory, still do not have water, or have disrupted service, free tap water still is available for fill up at the water filtration plant in New Boston. Bring you own jugs to the water plant. For residents living in Portsmouth, Rosemount, or West Portsmouth, if you have special needs, or are unable to leave your home to purchase water or fill up at the filtration plant, call the Portsmouth City Health Department call line. Until the issues can be fully resolved the health department continues to man 24/7 an information and assistance telephone line. 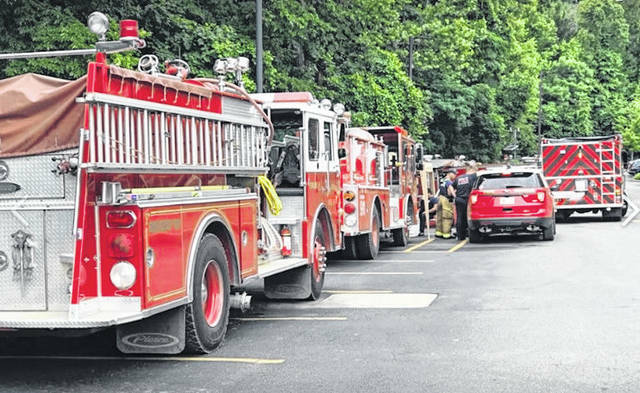 Call 740-354-8931.
https://www.portsmouth-dailytimes.com/wp-content/uploads/sites/28/2018/06/web1_SOMC-Water-trucks-2.jpgFirefighters from Portsmouth and several neighboring communities were working since roughly Friday to supply Southern Ohio Medical Center with water as the city’s water shortage continued. That effort was to come to an end early Thursday. The county EMA reported the mission to support SOMC was handed off to the State of Ohio Fire Response Plan, pulling in fire tanker and pumper reserves from across Ohio.